A luxurious, graphically compelling vision for contemporary domestic living, as observed and artfully presented by the Oscar-winning film star. 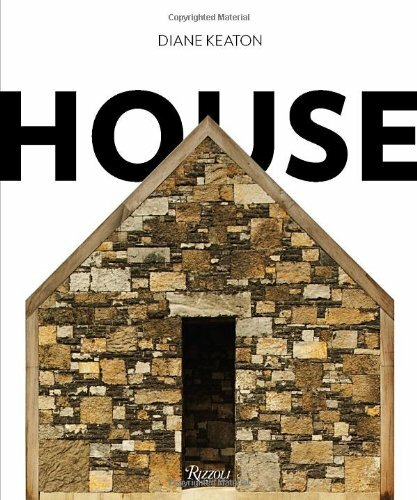 House is Diane Keaton’s stunning portrayal of the way we may and do live now, in rusticated, reimagined, or repurposed spaces across the country. Inventive designers, including Annabelle Selldorf, Roy McMakin, Rick Joy, and Tom Kundig, have brought their talents to bear upon the structurally old, the disused, and the antiquated, finding in these buildings the hidden beauty that lies beneath the surface of neglect and decay, and through their work revealing to us the many possibilities we might bring to our own domestic spaces.Through innovative design and repurposing, industrial structures and farm buildings, crumbling commercial lofts and rusting hangars are transformed and vividly revealed as thoroughly engaging spaces for living. House presents a graphically striking vision, frequently marked by strong geometries and primal coloration, that ignites the imagination of those intent upon redefining the possible as it pertains to one’s space—work that is joyous and rooted in our most basic understandings of home. If you have any questions about this product by Keaton Diane, contact us by completing and submitting the form below. If you are looking for a specif part number, please include it with your message.